Seen on DIY Network – 11 Times! Would DIY keep inviting WerEver back if they didn’t love our outdoor cabinets? WerEver’s outdoor cabinetry is featured on eleven different DIY Network shows. The popularity of outdoor living spaces, particularly outdoor kitchens, is growing across America. Why so many shows? Well it’s simple: Our cabinetry is AWESOME. It is beautiful, installs easily, and can be customized to fit your exact application. Our unique outdoor cabinetry is proving to be a popular choice for the experts. In the past, there was no option for weatherproof outdoor cabinetry. 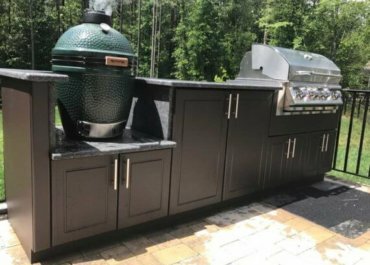 Unfortunately countless homeowners have made the wrong choice by building outdoor kitchens with wood, concrete, stucco, and stainless steel that either don’t function as an actual kitchen, or they don’t hold up to the outdoor elements. With twelve years of experience, thousands of projects nationwide, and a growing list of successful television makeovers, the choice is obvious. Pick WerEver Products to help you with your oudoor kitchen. In March 2010 we helped transform a boring, featureless yard into a breathtaking sanctuary including an outdoor kitchen, raised pergola, even a water feature with fire dancing on the surface. A desolate rock-filled backyard in Las Vegas was turned into a surfer-themed haven with a Werever outdoor kitchen, a surfboard garden, and a variety of other great decorations. A Tampa couple has no entertainment space, just grass on a sloping, uneven backyard. This backyard makeover consists of two thick paver patio areas. The top level has an outdoor bar made of polymer cabinets topped with granite and illuminated by different flashing colored LED lights. It also has a 40-inch TV built in. Adjacent to the bar are four grand water fountains underneath a decorative wood arbor. Then, step down on to a flagstone pathway leading to the lower level patio with a central fire feature adorned by three fire bowl columns. Tampa homeowners Elizabeth & William Gourdine have a new house and a blank slate of a backyard with a lake view. The space goes from empty to entertaining with a unique bar complete with infinity edge water & fire features; a metal pergola; built in outdoor kitchen area and a custom TV cabinet. This newly engaged couple receives an outdoor party place with modern privacy panels, a fireplace seating area and a custom made bar featuring Werever cabinetry. The Roman style columns are transformed and squared off. Privacy panels are built throughout the yard to match to square columns. Using lime green and cobalt blue colors on the columns and panels, a festive feel is created. This space is open and airy, yet private. Italian inspired outdoor room was built, featuring a pizza oven in front of a revolving wall, which has a movie screen on the other side of it. A wet bar with Werever outdoor cabinets is built adjacent to the Pizza oven which sits underneath a pergola supported by Italian looking columns made of concrete molds. The space has a complete outdoor kitchen and bar seating area all on top of tumbled stone pavers. We were picked as one of the best crashes in 2010 of all the “Crashers” themed shows. We were the highest rated YARD crash with our work on season 4. A backyard with a stunning view was turned into a Tuscan themed villa with a beautiful outdoor kitchen.